This is part of my rubber leg series of shank flies. 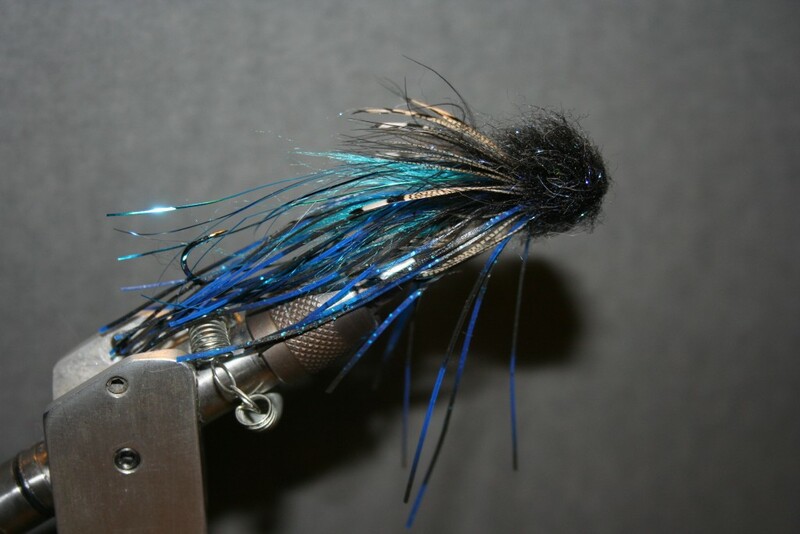 I’m a big fan of Blue or Purple when it comes to Swinging for Steelhead. Especially in low light Winter situations. Front Hook your favorite shank or I prefer a Mustad Salmon hook up turn eye. Back of Shank start with a good amount of Black Ice Dub to form a shoulder around that I use Blue Dog Hair, Craft Fur will work well too. Next after Blue Dog Hair I add my first Segment of Rubber Legs these are Bass Skirt Legs in Black and Blue Flake. Body Black Ice Dob wrapped towards front of Hook. Collar of Barred Wood Duck Flank Feather palmered towards front. Head Senyos Black Dubbing makes awesome Sculpin or Egg Heads.